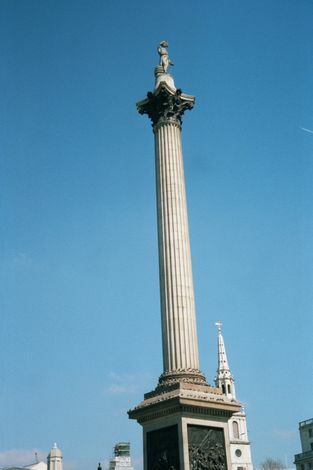 Another approach to London: still historical but this time looking not at the handling of the nation's trade but at the city's monuments, most erected to honour the people--almost all men--who created or maintained the empire that made that trade possible. 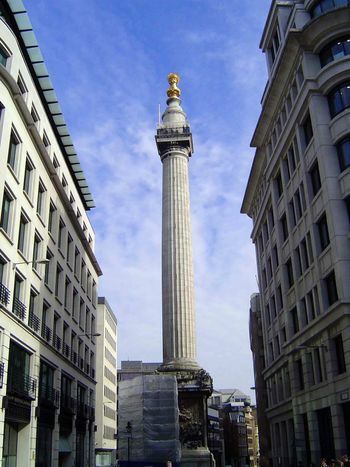 London may have more such monuments than any other city. 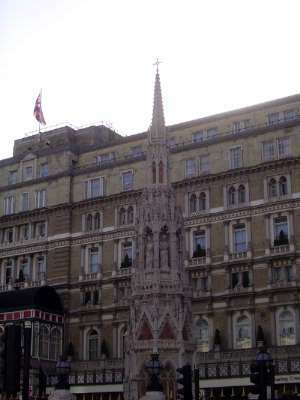 It was, after all, the world's biggest city at a time when honoring great men was itself an idea at its apogee. 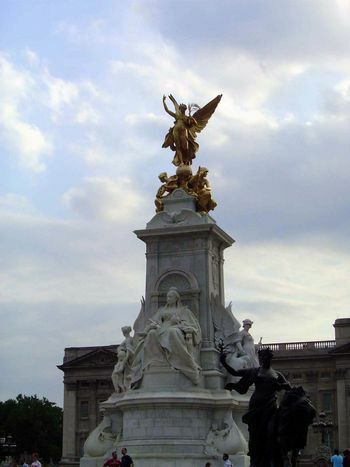 Pride of place presumably goes to the monarchy, here with the Victoria Monument by Thomas Brock, 1911. 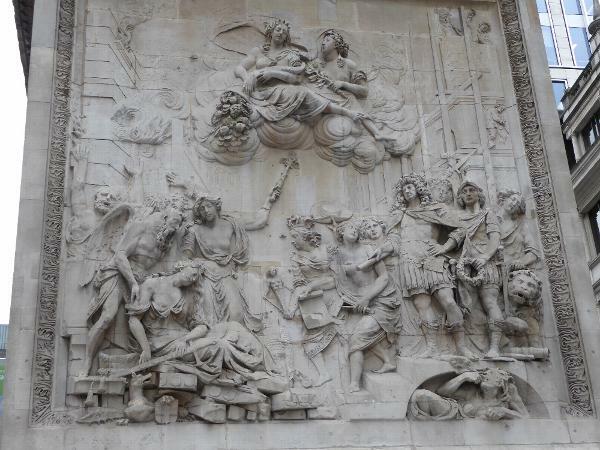 Appropriately for an maritime power, the base is quartered with wide-bellied ships while the angels of justice, truth, and charity stand on the level above, with the queen. 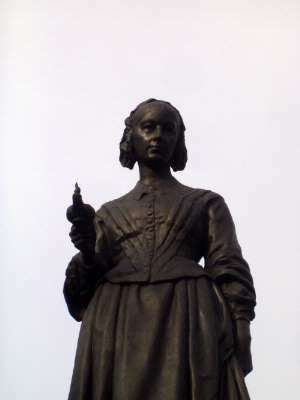 What thoughts ran through the minds of King George and Kaiser Wilhelm when they jointly dedicated this memorial to their grandmother? 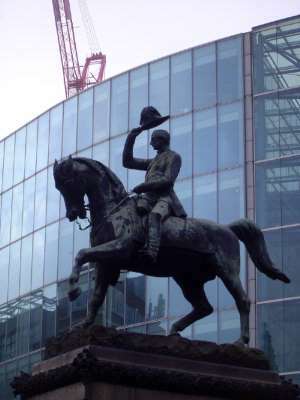 Prince Albert tips his hat at Holborn Circus. 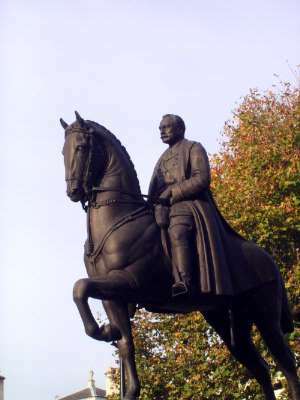 The building behind him is the headquarters of Sainsbury's. 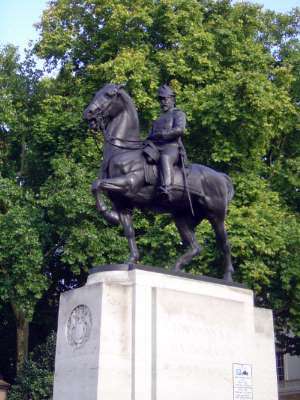 Edward VII at Waterloo Place. 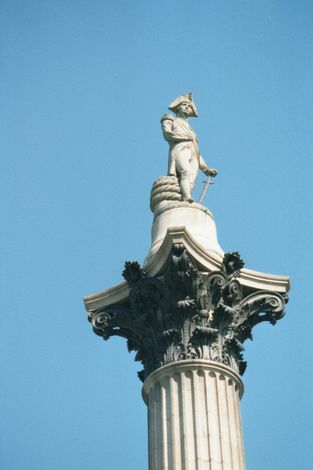 The capital is bronze melted from the guns of the Royal George, a Royal Navy flagship that in 1782 sank while anchored near Portsmouth; 800 men died. 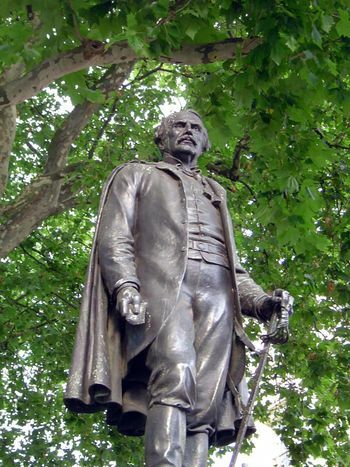 Close to Nelson's Column, this is a statue of General Henry Havelock, a hero of the Indian Mutiny. 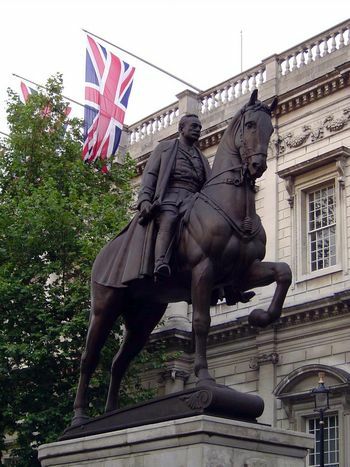 That title doesn't have the clout it once did, and in 2000 the mayor of London caused a mini-scandal by demanding the removal of the statue on the grounds that he didn't have a clue who Havelock was. 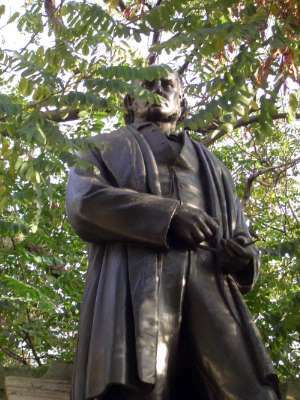 A hundred and forty years earlier, the statue had been paid for by public subscription to honor a man who, dying in the besieged Lucknow residency, is supposed to have said at the end, "See how a Christian can die." 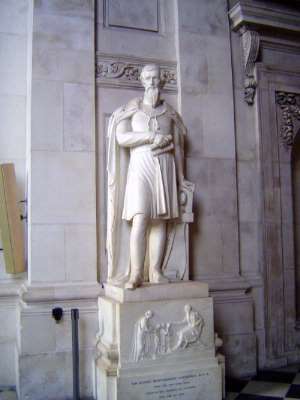 General Robert Napier at St. Paul's. 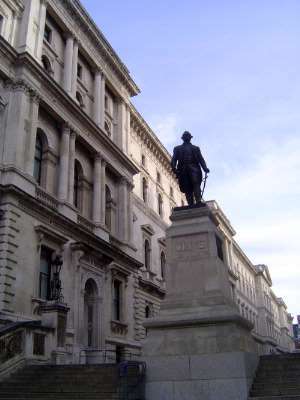 The Duke of Wellington gets some fresh air next to the Bank of England on Threadneedle Street. Clive stands just outside what was the India Office. 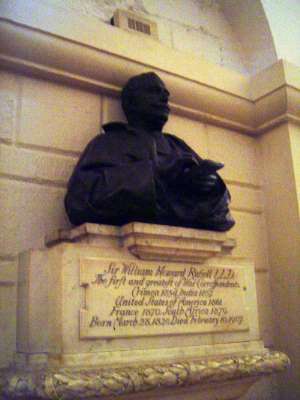 His career is illustrated at the base of the monument. 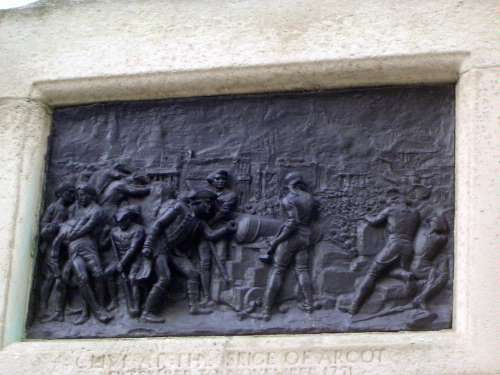 An early triumph: "At the siege of Arcot." 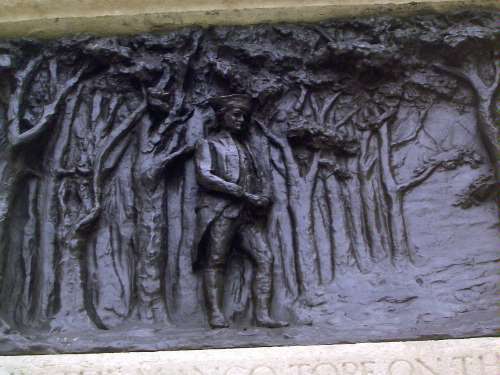 Clive is shown in a grove on mango trees on the eve of the Battle of Plassey, where Clive won Bengal. 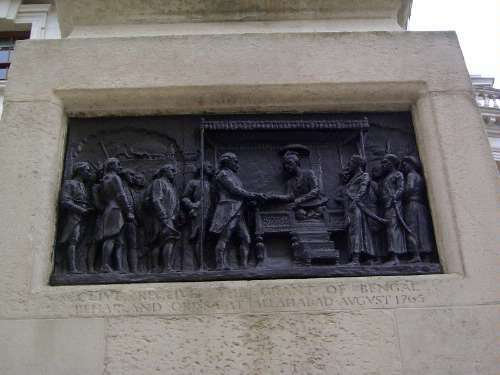 The inscription reads: "Receives the grant of Bengal Behar and Orissa at Allahabad." 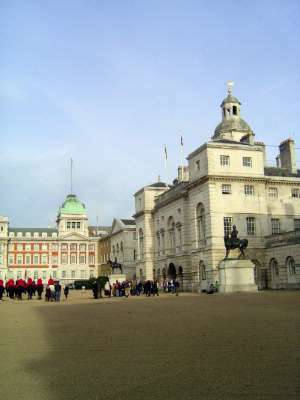 Two officers watch the Horse Guards Parade from plinths. 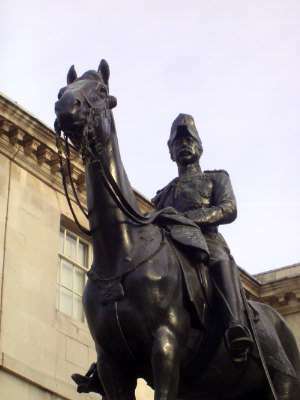 One is General Frederick Roberts, Baron Roberts of Kandahar, born in Kanpur (Cawnpore) in 1832 but rising to Commander-in-Chief of the British army in 1900. 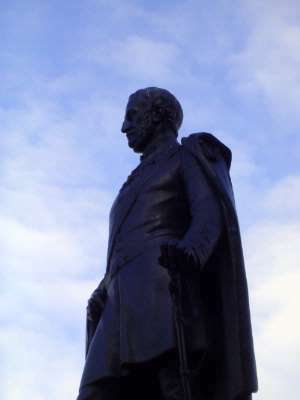 He succeeded Garnet Wolseley, the "model of a modern major general," who, as one biographer writes, through no fault of his own "never actually commanded a unit in the field against an equal adversary" and who certainly didn't want to be succeeded by "Bobs," a hero to the rank-and-file. 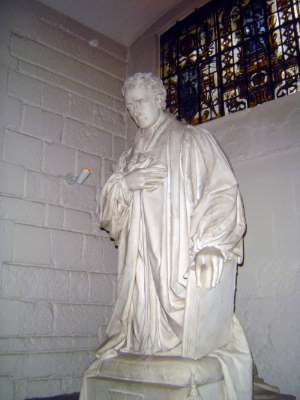 A more pensive figure: Charles Gordon, killed at Khartoum. 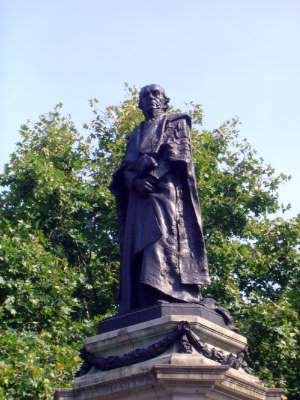 Reviled as a fool by Lord Cromer, master of Egypt, Gordon carried Victorian moral certainty to a fatal extreme. 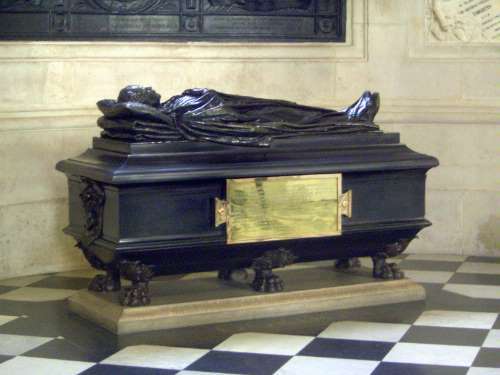 Here he seems to rest at St. Paul's. 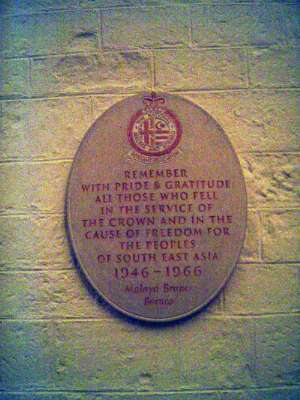 In fact, his body was never recovered from Khartoum. 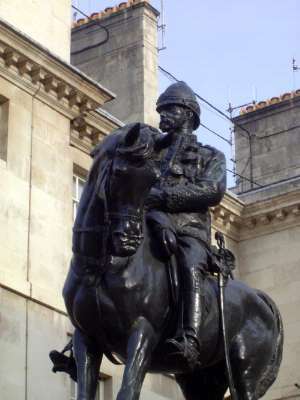 An appropriately fatigued Douglas Haig, British commander at the Battle of the Somme. 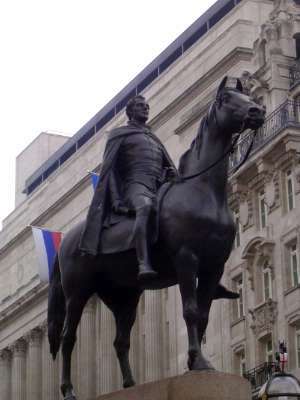 From the other side, he looks more resolute, befitting Pershing's assessment of him as "the man who won the war." 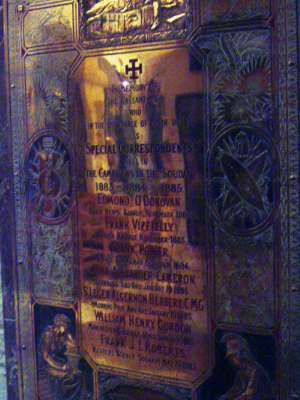 Drowned aboard HMS Hampshire, Kitchener has his own chapel at St. Paul's. 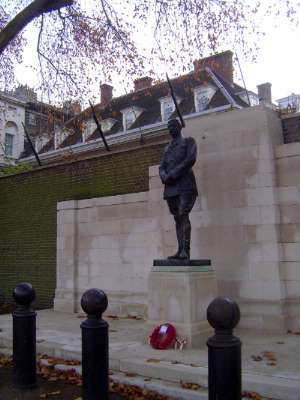 He also overlooks the Horse Guards parade and stands with his back to No. 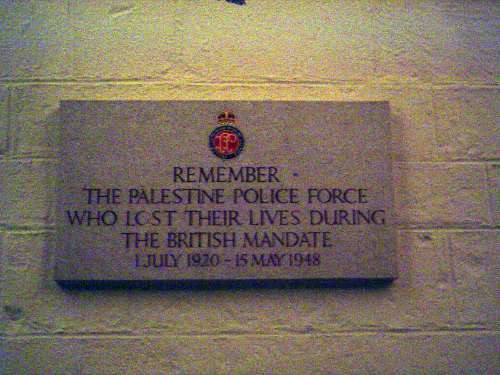 10, Downing Street. Hangers-on: the war correspondents who didn't make it home from the Sudan. 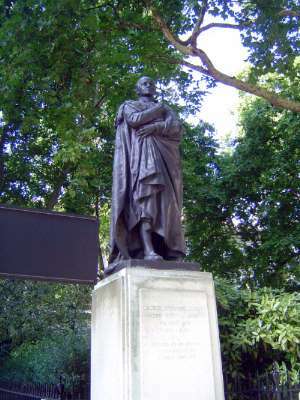 The founder of the profession. 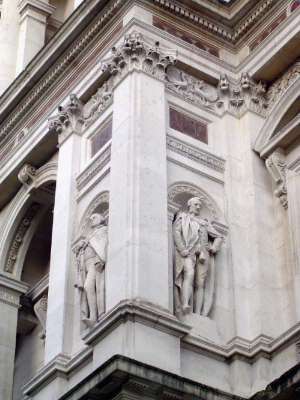 Could that possibly by him on the right, looking down from the heights of the old India Office and keeping an eye on Clive? 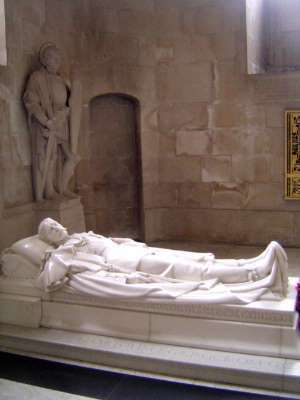 Lawrence's brother Henry, who along with Havelock died at Kanpur (Cawnpore). 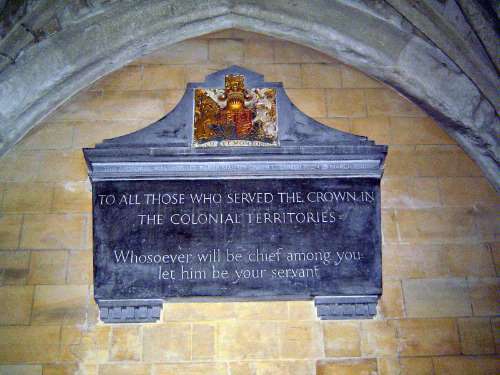 His is the tombstone there with the famous words, "He tried to do his duty." 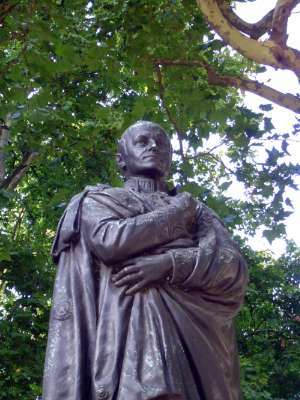 Here he appears in antique garb at St. Paul's. He doesn't appreciate the joke. 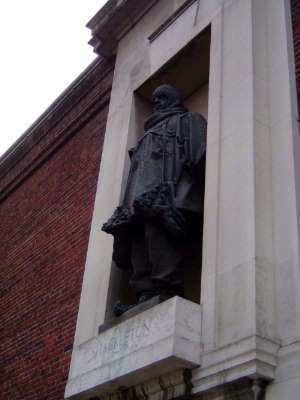 Just around the corner but decades earlier a statue of Ernest Shackleton was unveiled in 1932. He is bundled up against the Antarctic blast, which, along with Livingstone, explains the joke about this being "hot and cold corner." 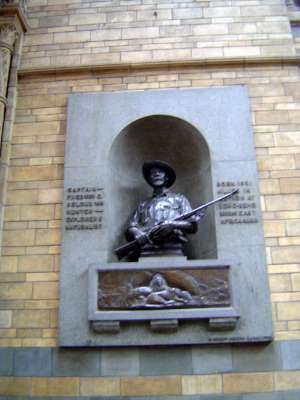 Sheltered inside the Natural History Museum, Frederick Selous, naturalist, collector, big-game hunter, author. 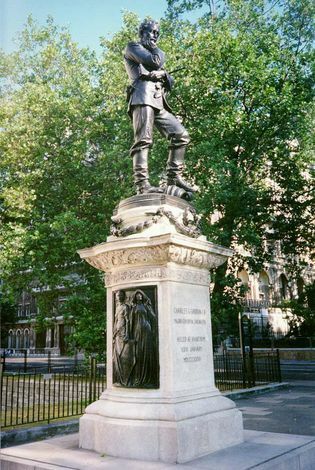 A German sniper killed him in East Africa in 1917. 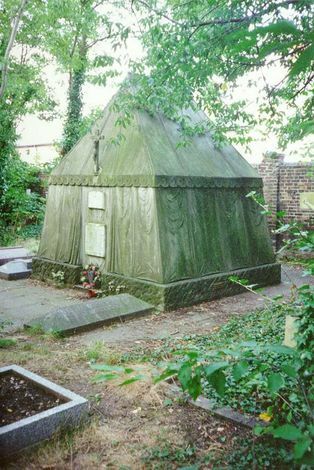 The oddest and perhaps the most intense of them all: Richard Francis Burton rests in a Bedouin tent here at the Mortlake Cemetery, South Warple Way, London SW 14. He landed here after India, Arabia, the upper Nile, South America, and the Levant. 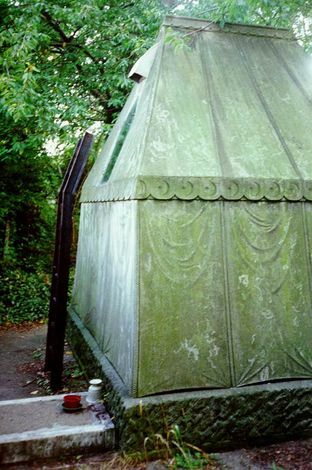 A consummate touch of Victorian sentiment, ever at risk of shading into morbidity: a viewing window and a ladder, the better to see the simple wooden coffins of Burton and his wife. A word for the Sudan. 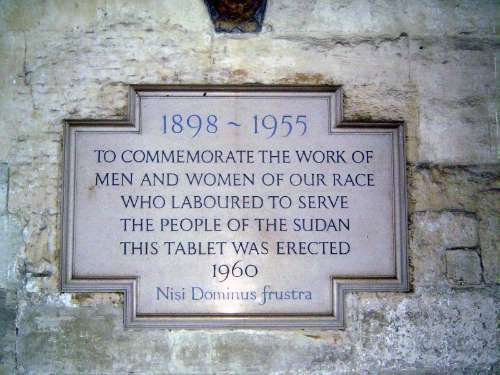 A comparable plaque in the St. Paul's crypt. 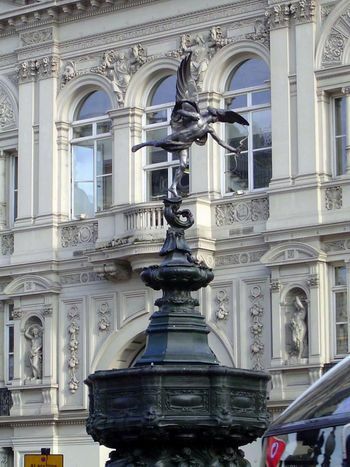 The famous Piccadilly statue called Eros but perhaps more accurately Anteros, selfless love. 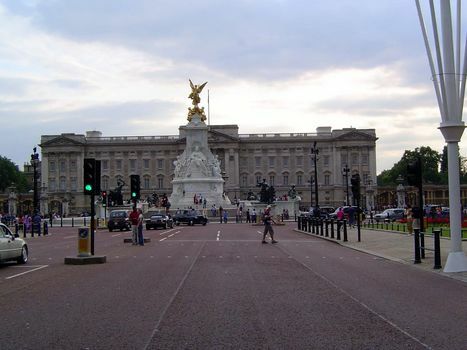 It dates to 1893 and commemorates the 7th Earl of Shaftesbury, who had died in 1885 after a lifetime of parliamentary advocacy in support of England's working class. 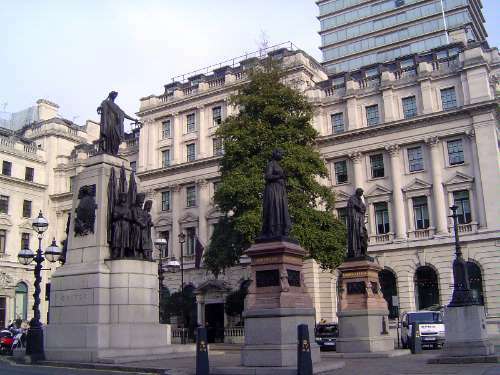 The statue in the foreground is Florence Nightingale, first prominent for her work during the Crimean War, memorialized behind her. To her left is Sidney Herbert, one of her confidants. She was not as gentle as the image suggests. 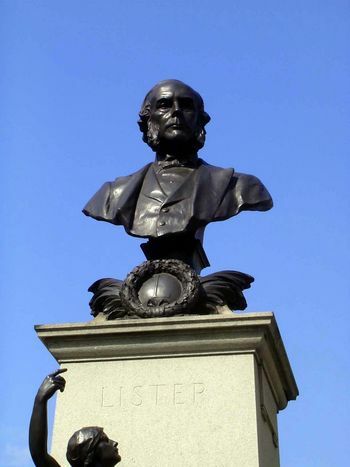 Joseph Lister, whose germ theory and use of carbolic acid in wounds dramatically reduced infection. 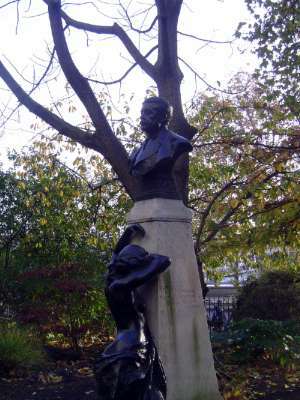 Arthur Sullivan hardly notices the grieving damsel, who looks like she could use one of his sweeter tunes. One guess. 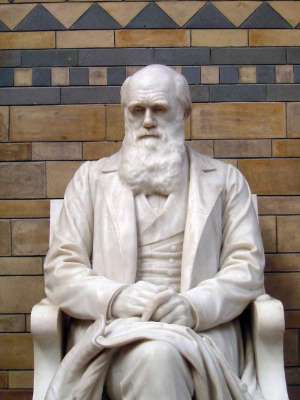 He sits in the Natural History Museum, of course. 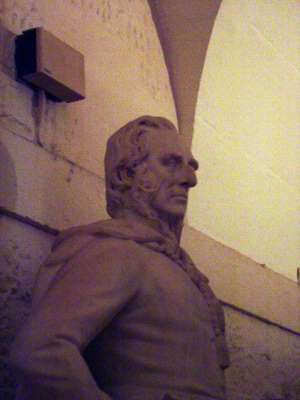 A couple of practical men: James Greathead, an expert in tunneling and a major figure in the history of the London Underground. 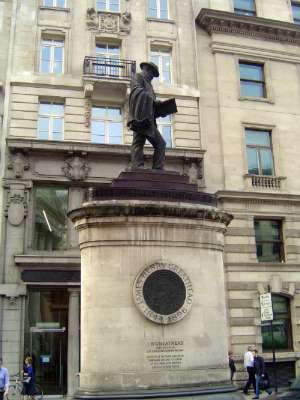 Isambard Kingdom Brunel, civil engineer extraordinaire, enjoys the sunshine in the Embankment Gardens. Politicians next to last. 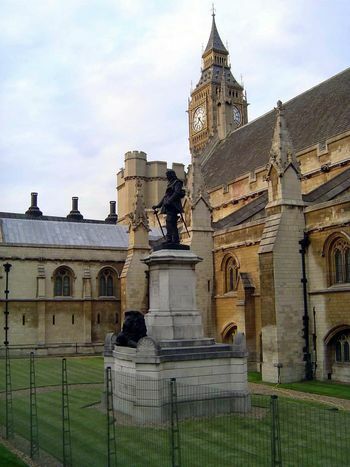 Cromwell stands protected by the best security money can buy. Gladstone, where the Strand becomes Fleet Street. 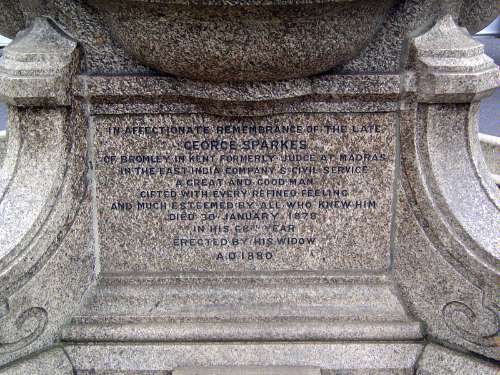 Not quite an unknown, Sparkes retired to London in the 1850s, bought a house at 16 High Street, Bromley, named it Neelgherries (Nilgiris, that is), and corresponded with Charles Darwin. At Sparks' death he apparently left his wife a fortune of 140,000 pounds. 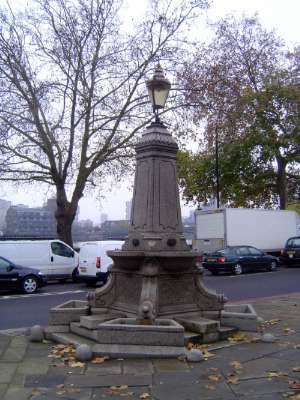 A more sober monument at Trinity Square Gardens, near the Tower of London. 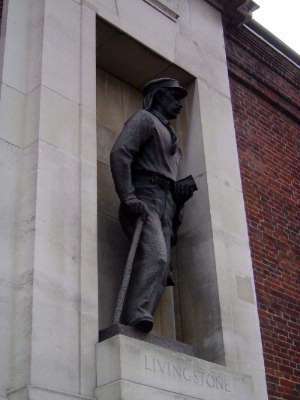 By Edward Maufe, the sunken garden behind the wall lists the 24,000 names of the men of the merchant marine who died at sea during World War II. 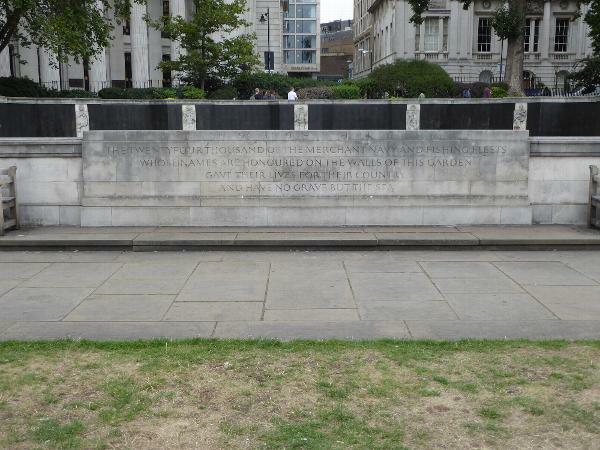 (An adjoining memorial by Edward Lutyens recalls those who had died in the previous war.) 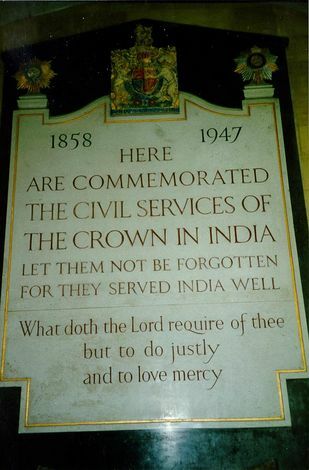 Maufe may not be well-known, but he was the UK's principal or chief architect to the Imperial War Graves Commission for over 25 years and as such shaped a hundred beautiful but somber places.